Different varieties of tomatoes are well-loved for their versatility in the culinary world. They complement a wide variety of dishes and sauces. Fortunately, they are also easy to grow even if you have very limited space. You can plant tomatoes in pots. 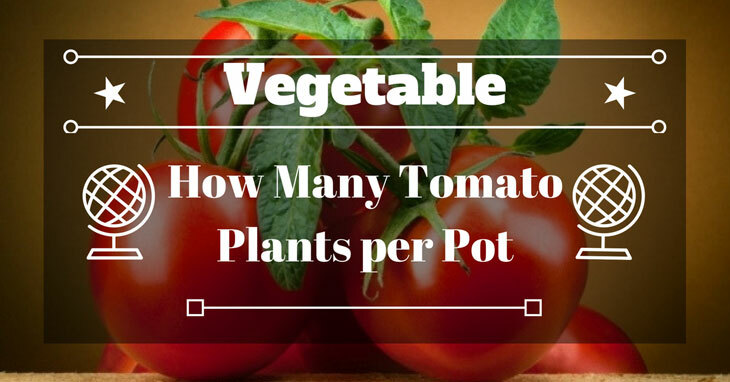 But for overall success, you should be able to identify how many tomato plants per pot you should grow. Tomatoes do thrive in containers. However, you need to grow the right number of tomatoes in a pot to avoid overcrowding. This will also help the plants attain optimum growth. The number of tomato plants per pot depends on the variety you are growing. Tomatoes tend to have different space requirements depending on whether they belong to the indeterminate, determinate or dwarf kinds. These are the tomatoes that grow wild, tall and out of control. They take up a lot of space as their central stems expand outward indefinitely. The common varieties of indeterminate tomatoes include Better Boy, Big Beef, Lemon Boy, Sun Gold, Sweet Million, Brandywine, Cherokee Purple, Kellogg’s Breakfast and Lillian’s Yellow Heirloom. Indeterminate tomatoes require substantial staking or caging for support. Because of their size and their need for substantial support, indeterminate varieties are not recommended for container planting. While not recommended for container gardening, you might still find success in growing one indeterminate tomato plant in a 5-gallon container. Also called “bush tomatoes,” the varieties that fall under this type have a more controlled growth. They usually grow up to approximately 4 feet and they stop growing when most to the fruits ripen or when fruits set on the top bud, and they die. Determinate varieties require limited staking and caging. They grow well in a container with a minimum size of at least 5 gallons. Popular varieties include Roma, Southern Night, Taxi, Martino Roma and Sophie’s Choice. You can plant one determinate tomato in a 5-gallon container. Tomatoes such as the Lime Green Salad, Dwarf Champion, New Big Dwarf and Summertime Green are among the popular varieties of dwarf tomatoes. These plants are more suitable for hanging basket and container planting. Dwarf tomatoes typically grow at a maximum height of about 3 feet and they produce fruits in a wide array of sizes and colors. The best thing about dwarf tomatoes is that they need just half the amount of space required by the determinate and indeterminate tomatoes. Typically, you can grow two dwarf tomatoes in a 5-gallon bucket. However, be sure that your bucket has a large surface area for adequate spacing. Plant the dwarf tomatoes 8 to 12 inches apart. Also, be sure to put in enough soil in the container. One dwarf tomato would need about 2 ½ gallons of soil. If you can’t tell which type of tomato a particular variety is, you can check this article from Mother Earth News as they have a detailed description of each type. 1. Using Small Containers – when it comes to container gardening, bigger is generally better as it can hold more soil. This is true if you are planting only one plant in a container. If you are planting two or more, a container with a bigger surface area is the better choice. 2. Watering too much – Adequate watering is key to your success in growing tomatoes. Too much water can drown the plant and too little water will promote rot. Also, inconsistent watering causes split tomatoes, end rot and stressed plants. When you water, you would want to keep the soil moist but not wet. If the soil is still moist from the previous watering, you could come back and water the next day. 3. Planting too much in a pot – Overcrowding plants in one pot is counterproductive. For optimum results, follow the rule we mentioned above. That is one indeterminate or determinate tomato per 5 gallons of container and up to 2 dwarf tomatoes in the same size of container. 4. Not exposing the tomatoes to the sun - Tomatoes need a full sun which means they need to receive direct sunlight for 6 to 8 hours a day. When growing in containers, it is easy to forget this as many tend to put their plants under a shade. For optimum growth, be sure to place your pots where your tomatoes will have unobstructed access to the sun’s rays. 5. Not fertilizing – Tomatoes are heavy feeders and fertilizing can give them a boost. Tomatoes have different requirements depending on their variety. You should have no problem adding organic fertilizers from time to time. But if you consider using the commercial ones, be sure to check out your tomato requirements before you start fertilizing. 6. Not staking or staking too late – Tomatoes grow fast and before you know it, they are already a few feet high. Most varieties of tomatoes require staking for support. It is best to set up the stakes before your tomatoes get too big and unwieldy. Tomatoes are among the easiest to grow in the garden or in pots. However, as tomatoes require adequate amount of soil and space, you’ll need to know how much tomatoes you can possibly plant in a container. The key here is to identify first the variety you are growing. Varieties that fall under determinate and indeterminate types require more soil and space than dwarfs.